"Plan Projected for a Cooperation of Defense of the Mississippi with Ft. St. Philip"
23 1/4" x 20 1/4"
Bernard Simon, an expert in French fortification planning, and Guillaume Tell Poussin, his cartographer and draftsman, worked with the U.S. Army Corps of Engineers to design permanent plans for protection of several American port cities. Here are two designs that show that the basic star design had to be modified to accommodate actual sites. 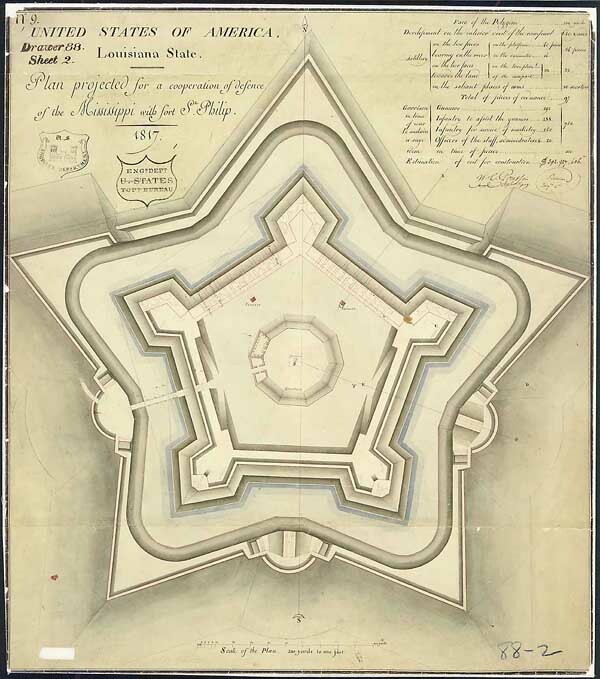 Fort St. Philip was part of the defense system designed to protect the approach to New Orleans, Louisiana. Here the basic five-pointed star design had to be modified to accommodate the marshy irregular site at Plaquemines Bend on the Mississippi River. Fort St. Philip was rebuilt several times during the 19th century. To print this page, please use your browser's Print button. To return to the previous page, please use your browser's Back button.